Orbital ATK’s Cygnus OA-7 resupply craft, the S.S. John Glenn, was berthed at the ISS Saturday morning. The OA-7 Cygnus – packed with equipment and supplies for the Expedition 51 crew – launched Tuesday aboard a ULA Atlas V rocket and performed orbit raising and refinement burns as it waited its turn for arrival at ISS, having to slip in after the Soyuz MS-04 spacecraft launched and docked on Wednesday. Launch of the OA-7 Cygnus resupply vehicle marked a return to United Launch Alliance (ULA) and Atlas V launch operations for Orbital ATK. 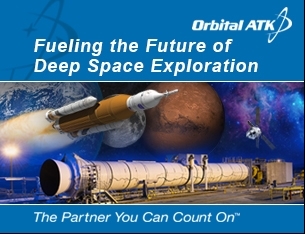 Following the launch mishap of the Orb-3 mission in October 2014, Orbital ATK contracted with ULA for two launches of their Cygnus vehicles on an Atlas V.
Those two missions – OA-4 and OA-6 – were successfully flown out of Cape Canaveral Air Force Station SLC-41 in Florida in December 2015 and March 2016, respectively. After OA-6, launch operations for Cygnus shifted back to the newly upgraded Antares rocket – Orbital ATK’s internally-developed launch vehicle – which successfully returned to flight on 17 October 2016 from the Mid-Atlantic Regional Spaceport at Wallops, Virginia. With Antares making her comeback from the Orb-3 failure, the launch vehicle gained high praise from Orbital ATK, who noted the vehicle’s excellent performance as it pushed the enhanced Cygnus module toward orbit and a rendezvous with the International Space Station. However, despite Antares’ successful Return To Flight, NASA began discussions with Orbital ATK shortly thereafter, asking the commercial company to take advantage of the Atlas V rocket’s ability to pack more payload into Cygnus and therefore switch the OA-7 mission from Antares to an Atlas V.
With ULA’s introduction of their RapidLaunch service agreement – which can take a rocket from contract signature to launch in just four months or even less depending on mission specifics, Orbital ATK was able to oblige NASA’s request and purchase an Atlas V just four months prior to OA-7’s original liftoff target. 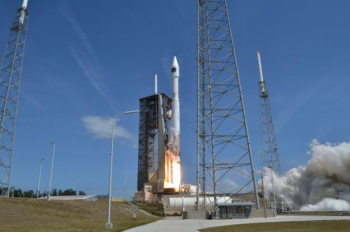 After over a month’s worth of delays, an Atlas V rocket successfully launched the OA-7 Cygnus into orbit Tuesday morning, with an on-time lift off of 11:11:26 EDT (15:11:26 GMT) from SLC-41 at the Cape Canaveral Air Force Station. With Wednesday’s successful launch and rapid sequence docking of the Soyuz MS-04 spacecraft with two new residence for the Expedition 51 crew, Cygnus completed her orbit-raising and refinement burn sequences to properly align with the International Space Station for the commencement of Final Approach operations. During this “coast to ISS” phase of her mission, Orbital ATK Cygnus controllers in Dulles, Virginia, commanded the craft through the first of a series of rendezvous phasing burns (called DV – Delta Velocity burns) to refine the spacecraft’s trajectory toward the Station. The first DV burn was conducted in the early phasing period. Lasting approximately 10 minutes, the burn raised Cygnus from its initial near-circular 230 km orbit to the 400 km orbit of the ISS. A similarly long DV burn followed to again raise Cygnus to its proper orbital altitude. 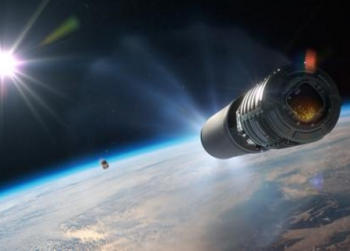 This was then followed by a phasing burn to align Cygnus into the exact orbital corridor of the Station. 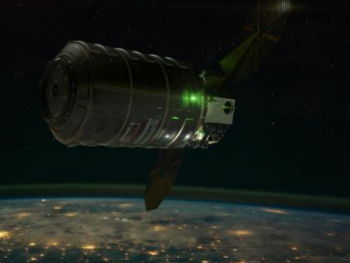 A final set of DV burns – conducted over the past two days – then brought Cygnus to its “Go/No-Go for Joint-Ops” decision point, which it reached roughly five hours prior to capture. Once Cygnus received the “go” from MCC-H (Mission Control Center – Houston) for Joint Ops, Cygnus began to slowly approach the Station. The craft reached the Joint Targeting Reference Point (JTRP) just over three hours prior to capture at approximately 03:00 EDT (07:00 GMT). From this point until capture and berthing, every step of the rendezvous required a strong communications link with Cygnus. This comm link between Cygnus, the ISS, and ground controllers is routed through the JEM (Japanese Experiment Module) PROX system and ensures the ability to manually abort – or at least retreat – Cygnus’ approach to the Station in the event of a problem with the spacecraft or the ISS. While aborts during proximity ops are rare, they do happen – as was seen in February with CRS-10 Dragon’s arrival that had to be aborted because of a relative GPS hardware issue. For the OA-7 Cygnus, once the craft arrived at the JTRP, the S.S. John Glenn stopped all relative motion with the ISS and awaited a second “Go/No-Go” decision from MCC-H. Arrival at the JTRP also marked the beginning of the Joint Operations Phase (JOPS) of approach, as overviewed in documentation in L2. Approximately three hours before capture, and with MCC-H providing a “go” to proceed, Cygnus performed the first of four ADV thruster burns (ADV1) to begin moving closer to Station. 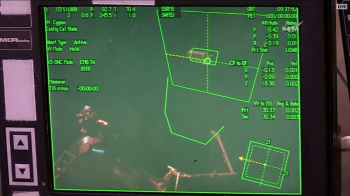 During these proximity ADV burns, Cygnus – until capture – used the TriDAR vision system designed by the Canadian company Neptec with support from NASA and the Canadian Space Agency. 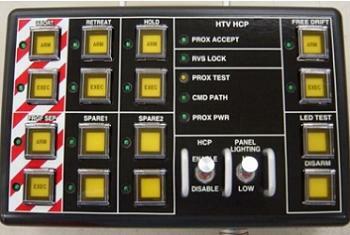 TriDAR – tested during several Space Shuttle missions – provides Cygnus controllers with real-time visual guidance for navigation, rendezvous, and docking procedures. After the first two ADV burns, the ISS crew maneuvered the Station to its capture attitude – a 5 minute process that took place just over two hours prior to Cygnus’ targeted capture time. Once Station has been reoriented, MCC-H issued another “Go/No-Go” decision for the final two ADV burns of Cygnus. 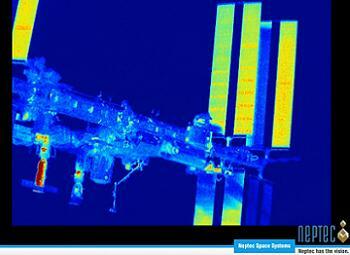 The third and fourth ADV burns brought Cygnus to its 250 m hold point below the ISS. MCC-H then gave the “go” for Cygnus to depart the 250 m hold point and enter the Keep Out Sphere (KOS) of the ISS. Cygnus then pulsed its thrusters and enter the KOS – at which point NASA controllers at MCC-H joined the Orbital ATK control team for the final close proximity ops of rendezvous and berthing for the OA-7 Cygnus. 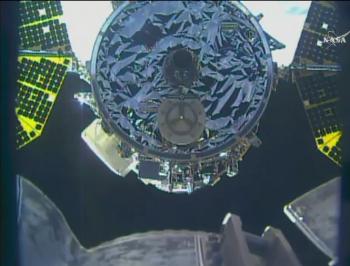 Just under half an hour prior to capture, Cygnus arrived at the 30 m Hold Point. Five minutes later, Cygnus received the “go” to proceed to the Capture Point, at which time it departed the 30 m Hold Point just over 15 minutes prior to capture. Cygnus then arrived at its capture point 12 m from the ISS about 8 minutes prior to the first capture attempt from Expedition 51 astronauts Thomas Pesquet and ISS Commander Peggy Whitson. Using the Station’s 17.5 m Space Station Remote Manipulator System (SSRMS) robotic arm to grab hold of Cygnus, capture occurred at approximately 06:05 EDT (10:05 GMT). After Cygnus was firmly in the SSRMS’s snares, Pesquet and Whitson maneuvered the S.S. John Glenn to Node-1 Unity (delivered by Space Shuttle Endeavour during the first ISS construction mission in December 1998), where the craft was berthed to the ISS at approximately 08:40 EDT (12:40 GMT). Later on Saturday, the crew will start to unpack the 3,376 kg (7,443 lbs) of research equipment, spare parts, crew supplies, and goodies. The OA-7 Cygnus is scheduled to remain attached to the Space Station for 88 days, which would place unberthing on 19 July 2017.